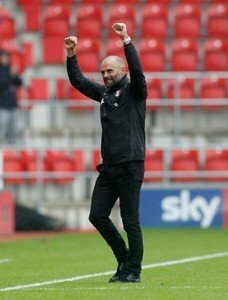 Rotherham United Manager Paul Warne said that although his players gave everything they had today against Swansea City he wasn’t that happy with the performance. Speaking to iFOLLOW after the win at the New York Stadium the Millers Boss said that he thought Swansea were better than the Millers all over the pitch but he was proud of the result. I think the Millers did well to go into half-time just one-nil down, more due to ‘keeper Marek Rodak than anything else. And, at one down there is always a chance to nick a goal – Rotherham did better than that, they nicked two. I think the first was definitely a penalty but, hand on heart, I wasn’t so sure about the second. But that’s the luck you get in football and Rotherham United have deserved that luck. I have to say that I think Swansea are the best side I’ve seen at the New York Stadium this season. They passed well and seemed to know where all their colleagues were, their football was good but, the bottom line is, they didn’t score as many or more goals than Rotherham. Today wasn’t about the performance (which is probably just as well) but it was good the way the team kept going and, more importantly, all about the three points.